Super! Indeed, it is hard to find the right superlatives to describe the 2009 Finnish Free Flying Camp. As usual the country's paragliding enthusiasts gathered to celebrate and honour midsummer, at Jämi airfield. And as usual the first two days (20-21 June) were rainy. Between the showers some powered pilots managed to fly and when late Saturday evening the sky cleared out Juho tried to fly the Jämi ridge, so despite the weather those days could be bookmarked as flyable. On Sunday morning we were welcomed by a perfect blue sky and the early hours were effectively used to tow some less experienced pilots and flying students. Soon the air became thermic though and it was time to plan a cross-country flight. 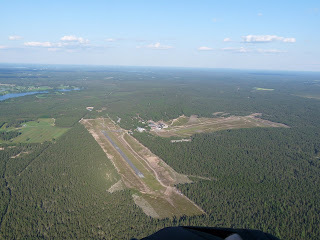 We set out to fly an ambitious triangular course, via Lavia to the Hämeenkyrö airfield and then back to Jämi. It turned out that the winds aloft were a bit stronger than predicted and that southwest flow made the task a notch too difficult. I myself almost managed a slightly smaller triangle but bombed out in the last leg, some 5 km from the goal. Other pilots decided not to fight the headwinds and flew downwind; Mika for example flew a nice 35 km to Parkano. Several of us had to go back to work then but many lucky ones could stay. The weather only got better all the time and pretty much all pilots managed ever longer flights. On Thursday Jussi and Vesa got clearance to fly through the Pori airspace towards the famous Ytteri beaches on the west coast, and ended up just inland of the beach to be warmly welcomed by the masters of the estate where they had landed. The same evening I managed to get away from work again and do three nice evening flights, with the last one taking me up to over 1000m AGL, and this at half past 8 in the evening! All evenings were really nice, with such clear skies it really is light throughout the night. Friday was another good day and we planned another, larger, triangle: via Parkano to Hämeenkyrö airfield and then back to Jämi. I was the first to get towed up and managed to work my way up in the early weak thermals. I waited for a while but it seemed nobody was going to join me so I set off for Parkano. As the thermals were not that strong this first leg took a while, but up to some 5 km before the Parkano turnpoint it had been fairly easy to make progress. There I got pretty low but found good lift over some fields. Once back at cloudbase it was easy to glide to Parkano. The straight route south to the next turnpoint was not an option as there was an enormous blue hole (an area without any clouds, hence presumably with no lift). So I flew back to the same field where I caught the same thermal, now a bit higher. From there I tried to fly the western edge of that blue hole, but as I was doing that it seemed to expand westwards. It turned out that some time later I actually was back at Jämi. By now I had been almost 4 hours in the sky and decided to check out if I could get some company at the airfield. I didn't see any other paragliders but did notice that a nice cloudstreet was forming in south-easterly direction towards my turnpoint! So I went for the first of those clouds to find a nice strong, yet smooth, thermal. And then two sailplanes speeded towards me from the north; company after all! I tried to make some pictures, but fiddling with my camera really detoriated my thermalling accuracy and hence the sailplanes were coming up quickly towards me. So put my hands back on the brakes to control my wing and steer into the thermal core. Almost at the same moment the sailplane pilots decided that they were high enough and continue to race southwards (presumably towards Räyskälä, where the Junior World Gliding Championships take place). A bit later a started to glide along the cloudstreet that took me to within gliding distance of Hämeenkyrö airfield, the turnpoint. But by now this was firmly in the blue hole area and it seemed highly unlikely that I could get up there. 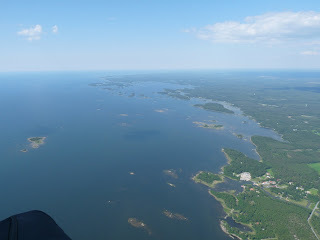 As the flight back to Jämi seemed easy and quick I decided to call it a day and fly back. After a whoppy 6 hours landed right where I had started my tow (flight track). Saturday more people turned up, including hangglider pilot Ville. The predictions still forecasted easterly flows, and Mika suggested we all try to fly to Merikarvia, right at the coast. This time Juho was towed up first and soon was high and started to work his way westwards. I was next and also got up but noticed that the clouds were gathering together in big lumps that caused enormous areas along the route to be shaded. Not good, and not the situation to fly a direct course. I decided to try to southern edge of the cloud constellation to ensure I would have sunny fields within good reach at any time. This worked well. Once I was at the end of the clouds decided to glide furiously towards a largish area with similar fields. The sink on the way was as bad as I expected, or worse. Above those fields I found some boyant air, but no real lift. I tried to scan as much of the area as possible and then noticed some gulls that started to thermal low. They saved the day as I could just get to that spot and join the thermal, that eventually carried me all the way to cloudbase again, now at some 2300m. From there on it was fairly straightforward to fly to the coast, but it remained important to go around the large shady areas. The equally large clouds only lifted in very few and small spots, so every now and then some serious thermal hunting was required. Using this strategy I actually managed to approach the coast quite high, and greatly enjoyed the very rare opportunity to fly out a bit over the sea! I could see from the waves and foam that there surely was a good seabreeze down there but at my altitude of some 1000 m there was almost no wind at all. Time to take out the camera! Little later I went back to the town and landed in the local baseball field, indeed in a 8 m/s headwind. Just when I started to pack I noticed Mika approaching from the south. As his radios were without power my attempts to provide him with information on the conditions at landing were useless. In fact he had not noticed me at all and in the end landed a couple of hundred meters north of me. Little later we celebrated our success at the terrace of the local kebab restaurant. This was actually next to the church, a very large wooden construction and apparently indeed one of the largest in the Nordics. Later we heard that pretty much all pilots had managed to get up and away and many broke personal records for time, altitude and distance! Indeed a super day. Sunday morning those that had been all week flying their socks off decided that the bed and shower at home were more attractive than another hard day of flying. Me and the others that had been grounded during the week did not want to miss the opportunity of another good day and set out to tow in very different conditions. A drier air mass was flowing in from the north west, causing much more gusty conditions and snappy narrow thermals in the airfield area. Only on my third tow did I manage to follow one of those up. The now much stronger winds made me drift to the southeast and I decided to go for the short classic flight to Sammi, a mere 15 km away. With an eye on the upcoming Nordic Open championships I decided to try to practice a "final glide", i..e. to start to glide to the goal at just sufficient altitude. I wanted to that at 1500m but around 1300 m I hit an inversion and the air became very turbulent. As I'd drifted a bit more closer I decided to give it a try. As I'd expected I ended up a bit short, making me a little more confident about guessing those final glide altitudes. Nowadays we of course have our instruments to do most of that work, but as my XCTrainer was in service I had a good chance to hone my own skills. Two other pilots took off much later, enjoyed quite much better conditions and could fly all the way to the Tampere approach area. In the end we had 7 consecutive days of excellent XC flying, none of us could remember a similar period. For example Mika reported 19 hours in 19 flights over the week; I did 11 hours in 3 days. And the weather is still very good! Some of us managed to upload some flights to our own Finnish section in the XContest.